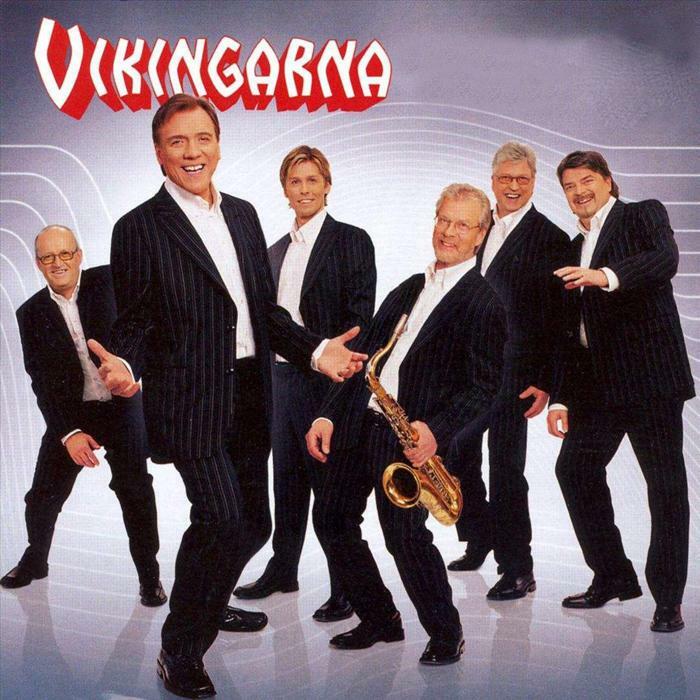 Vikingarna were a Swedish dansband, formed in 1958, and disbanded in 2004 after an extensive farewell tour. They are the best-selling dansband in Scandinavian music history, and are often regarding as the greatest dansband to have existed, and had at the time of their final studio album sold more than 11 million records. In 1958, as skiffle bands were reaching the height of their popularity in Europe, “Ji-Coo and the Vikings were formed in Sweden”. The initial lineup consisted of Gunnar Olsson on guitar, Hans Axelsson on bass, Egon Olsson on drums, Svante Valjestöl on keyboards, Jens “Ji-Coo” Carlson on saxophone, and Newman Alexander on trumpet. The band did not have lead singer at once, but after a series of auditions, Kerstin Larsson was hired for the job. The band became a local hit, and in 1961, they were given a shot at recording their first EP, “Viking Boogie”, which entered the Top 20 charts on Radio Luxembourg. However, the rising fame became a struggle for many of the members, and by the end of 1961, the band had split into two camps: those who wanted to continue, and those who didn’t. As Jens “Ji-Coo” Carlsson resigned, the band was reformed as “The Vikings”. The newformed band soon found popularity once again and began touring the country, playing dance halls and other venues. They went through several member changes, rarely having a steady line-up for more than a year or two, eventually going through a list of 24members by 1973. Notably however, two of the members arriving in the early 60s would remain for many years: saxophonist Tony Eriksson and guitarist Jörgen Arnemar. In 1963, they recorded a cover of country standard The Tennessee Waltz, selling 20, 000 copies, but falling short of any real success. By the mid-60s the band had gradually changed their style to dansband, a new style of music in Sweden that was gaining popularity. But as the band entered the seventies arrived, they had yet to make a record, much to nuisance of several members. With a final set of changes under the Vikings name, the bands 1973 roster consisted of Jörgen Arnemar (guitar), Börje Gunnarson (bass), Per-Anders Carlsson (drums), Tord Sjöman (piano, organ, vocals), Tony Eriksson (saxophone and keyboards), Christer Linde (trumpet) and completing the line-up, lead singer Stefan Borsch, who had joined the year before. One night that year, as the band was rehearsing, guitarist Jörgen Arnemar brought his tape recorder to the locale and left it recording, filling a reel of magnetic tape with a runthrough of their repertoire. The reel was then sent to EMI Odeon, who were impressed with what they heard, and offered the band to record a volume of the labels “Det Går Som En Dans”, a series of records featuring lesser known dansbands. However, when the contract arrived for them to sign, the label had mistakenly translated their name from "the Vikings" to "Vikingarna", and so, the band decided to keep the "new" name. The album gave the band their first hit, entering Svensktoppen in 1974, with the song "På världens tak", a Swedish cover of The Carpenters hit "Top of the World". Subsequent years saw many members added and removed to the lineup, when ultimately, the band disbanded in 2004. In total, numerous musicians were part of Vikingarna during its 46 year existence, with over three dozen albums recorded.